Style meets performance with the Minta kitchen tap. With its L-shaped spout, this kitchen mixer will add an attractive accent to your kitchen. Meticulously designed in every detail, it offers unparalleled versatility. It comes with an adjustable swivel range that can be set to 0°, 150° or 360°, allowing you to lock the spout in position or switch easily between two basins. Thanks to its high spout, even tall pots are filled effortlessly. Engineered with GROHE SilkMove technology, it has a ceramic cartridge so water temperature and volume control are controlled with effortless precision. 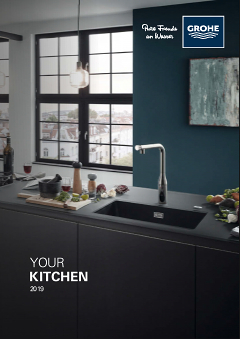 With our easy installation system, you'll have your new kitchen tap mounted in the blink of an eye and it will be a stunning visual highlight in your kitchen. Finished with durable GROHE StarLight chrome coating, it will retain its dazzling look even after years of use.